Couple of weeks back, as I was reading my daily quota of news on Google, I came across this article on dosas. I was quite surprised to see our plain old dosas getting prime-time on WSJ. The article screamed “Move over tortillas, dosas are a-coming!”. Anyway, proud as I was of the attention our dosas were getting, I forwarded the link to friends and family. And this led to an email exchange with one of them on how the dosas morph in our kitchen. That gave me an idea and I decided to share the different avatars dosas take in my kitchen. Without counting the plain dosas with chutneys and milagai podi (although literally means chilli powder it isn’t quite that). a) Use dosa as a wrap and stuff it with a dry roasted mixed vegetable sabji (called as “kari” – not the same as curry – by tamilians). The traditional one is, of course, made with potato and called “Masala Dosai”, but you can use any vegetable or combination of them, optionally with paneer, to make a dry sabji, with any spices of your choice, and use it as stuffing. b) Make a mean paneer burji or even chilli paneer for a more protein filled meal. c) Make a pizza or quesadilla out of dosa by adding cheese and jalapenos (or red chilli flakes). You can also add slightly roasted veggies to make it a complete veggie dosa-pizza. This can be either served open, like a pizza, or closed, like a quesadilla. 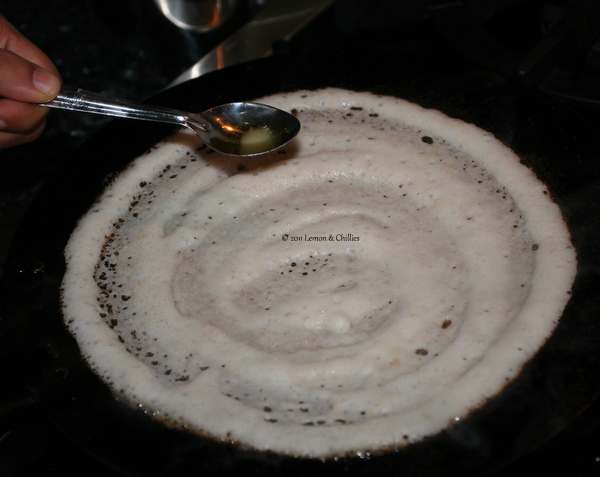 d) A trick that I picked from my MIL – when you have just a few ladles of batter left, add a handful or two of rava (semolina) to the batter, add chopped ginger, onion (optional), green chillies to make (onion) rava dosa. Of course, you can use this as a base and stuff veggies, paneer etc. 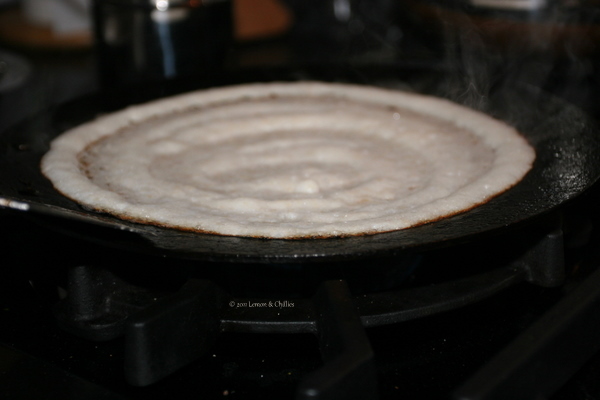 e) When the batter is fairly old and heavily fermented, make uthappams (thick dosas) with it. Add chopped tomatoes, chillies, onions on top for a colorful veggie uthappam. So, now tell me, what shape and form does a dosa take in your kitchen? When I was perusing the cooking section @ my local library, this book – Love Soup – seemed interesting enough to pick. I glanced through this book and found quite a few interesting recipes – some old, some new and some wild. I have earmarked quite a few of them to try and this was the first one that I made. If I can make a judgment call on 160 recipes based on just 1, then this book is a keeper. There are some recipes that sounds really exotic but you know it won’t work for various reasons and some that sounds exotic and plausible but doesn’t turn out as good. This one sounds exotic (the soup is named “Indonesian”, for crying out loud 🙂 ), downright practical, comes together in a jiffy and tastes delicious. So, now tell me, whats not to like about this soup and this book? I picked this soup out of the scores of others that I had earmarked as I had all the ingredients needed for this soup handy – yes, I am cheap and lazy 🙂 But don’t ask me, why I bought parsnip, for the first time, during my previous grocery run – I have no clue either. It was there, sitting fresh and pretty in a parsnip-y way and I couldn’t resist buying it. Most often, I buy things out of a whim and scurry around for a recipe to use them but this time somehow, everything came together ever so correctly. Not sure how many of you out there are true recipe followers but I am not. Almost always, I cannot stay 100% true to a recipe, I always add a little something of my own to it, and in a weird way, feel that it completes my cooking experience. The little twist that I added to the recipe makes it mine and personal. This recipe has my twist as well and I have made a note of it, so that you can omit it, if you are not upto it. Once the veggies are fork tender, blend them well, preferably using a hand-blender. Now add the peanut butter & lemon juice and let it simmer for about 5-10 mins. Believe it or not, that’s it and the soup is ready to devour! 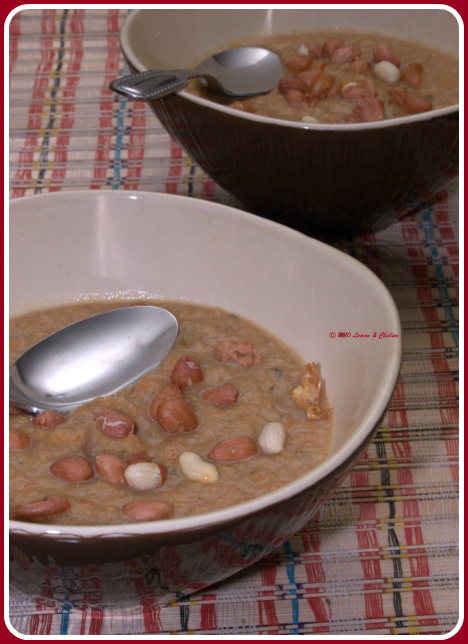 Optionally, you can toast some peanuts and use it for garnishing the soup. We are well into November and there is no doubt that Fall has arrived unlike the hide-and-seek that Summer played, at least in this part of the world. The evenings are dark and gloomy, especially so after the time change. It is so cold, even inside the house, that I don’t feel like spending long hours in the kitchen to cook. Time for one pot dishes (are you listening?) and more specifically, soups. Nothing feels more comfortable than snuggling over a warm bowl of soup and to make it more luxurious, some garlic bread. Fall is the season for squashes and melon, and my local produce store has an abundance of these. These beauties look very tempting; it takes a lot of self-control to not splurge and buy lot more than the two of us can possibly consume. Over the years, I have devised a system whereby I don’t buy more than one variety of squash every week, lest I end up wasting them. Anyway, it was time to buy butternut squash last week, which, to me, is easily the best among equals. They have a vibrant orange color with a deep nutty, sweet taste that is amplified when roasted. I have made pasta with these occasionally but the soups are easily the best. Chop the butternut squash into 4 big pieces, brush them with oil and roast them till they are fork-tender. Scoop the roasted squash using a spoon, while leaving the skin intact. Alternatively, you can peel the skin before roasting the squash. In a thick-bottomed vessel or a cast iron pot, add a tsp of oil, followed by onion, tomato, green chillies, apple and salt; close the lid and let it sweat for a while. After about 10 minutes, add the roasted squash, kala channa, tamarind and the coriander-cumin-red chilly powder. Let this cook for another 10-15 minutes. Do *not* add any water. Add a cup of water and puree this concoction either in a blender or using a hand-held blender. Add the almond butter and pomegrante seeds, not before saving a couple of spoonfuls for garnishing, and let it simmer for a few minutes. 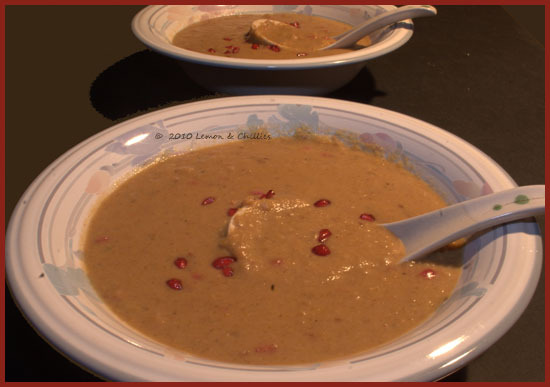 Ladle it into soup bowls, garnish with the reserved seeds and serve. Perfect meal for Fall evenings. Ah! Curry leaves! I grew up in an independent house(single-family home for those in the U.S.) in Chennai and where we lived coconut & mango trees are common sight. And so was it in our house. In addition, the house also has a curry tree – yes it is a tree, over 9 feet tall and thriving. We picked the leaves when we needed it – for tempering (thalippu) or thogayal – and it couldn’t have gotten fresher than that. May be it was the easy availability or abundance or the ignorance of youth, I never quite liked these greenies. I never understood why the elders went gaga over its flavor and was also not taken in by its medicinal value. The only use (thanks to my mom!) I had for these leaves was when they were boiled with good old coconut oil and massaged onto my hair. The first time I missed (or rather longed) for these leaves where when I couldn’t find them. Yes, we always miss what we can’t have and when something gets harder to get, fonder does our heart grow. Such is human nature, I guess! When SacramentoSpice posted her curry leaf chicken recipe (yes, you read that right!) and linked Manisha’s version, I remembered that I had bookmarked Manisha’s Kadipatta Chicken a while back. I wanted to try a vegetarian version of this and was toying with the idea of doing it with either cauliflower or potato (paneer would work well too, now that I think of it). When a dear friend gave me a ziploc full of curry leaves, picked fresh from her parents’ home, the timing could not have been more perfect 🙂 My recipe is very close to Manisha’s version, but am posting it again to record the minor tweaks that I did. Thanks, Manisha! 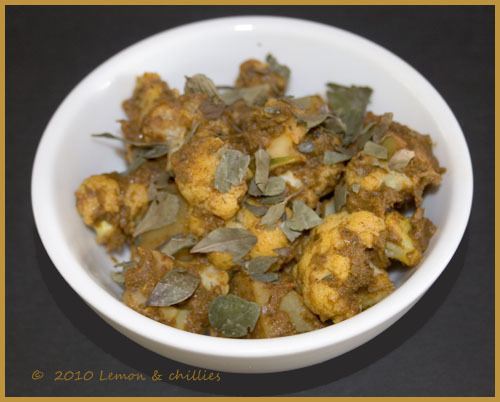 Onto the Kariveppilai potato-cauliflower fry (I couldn’t make up mind I decided to use both potato & cauliflower)! Saute the spices in a tsp of oil till they are well roasted but not burnt in a saute pan (or kadai). Add the kariveppilai to the spice mixture and saute till the leaves are fried well. Add the chopped onion, quartered tomato and salt, wait for the onion to become translucent. Let it cool and grind it to a paste along with the tamarind. (Tip: If you want, you can stop right at this stage and use this is a chutney / thogayal to mix with rice or use as a side dish to idli / dosai. If you want to attain kariveppilai nirvana, continue). Add the cauliflower – potato mixture to the same pot (to keep shy happy), close it with a lid and cook till the veggies are semi-tender. At this point, add the ground paste and cook till the veggies are fork-tender. If you want a watery dish, you can add a cup of water at this stage. But if you are like me and prefer a dry dish, hold the water. 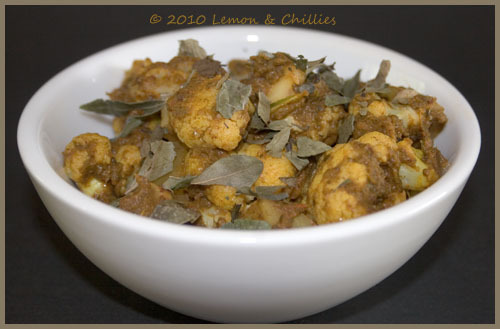 This is a perfect side dish with rice & dhal or with rotis. I was introduced to the world of blogs a few years back, when the blogs were few and far between and it was easy to follow the handful of blogs. Then, the blogs proliferated and much as I would have liked to keep myself abreast, it is just not possible to read all the blogs that pique my interest. That’s where Google Reader came to my rescue and whenever I found a blog that I liked, I followed it by adding it to my reader (*hint hint* add my blog to your reader, if you haven’t done so already 🙂 ). Anyway, my friends and I share and exchange notes on the blogs that we follow and I have come across quite a few new blogs through them. One such gem is Mriganayani, oh I love the name, introduced by my dear friend, Arch. I scanned through her blog and the one recipe that caught my interest was Cauliflower Pepper Fry. I love pepper (so much that I add it to my chai, for kicks!) and the combination looked like a match made in heaven. I followed her recipe to the T with few minor changes and made it dry, as I was going to have it with rice. This goes perfectly with rice as well as rotis and may make an awesome sandwich filling too. 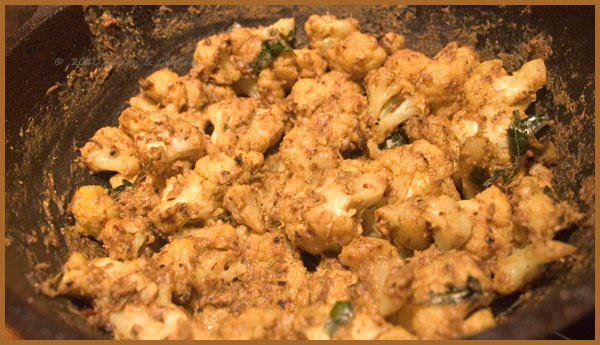 Saute the cubed onion with the spices (Black pepper, cumin & red chillies) in ghee and grind them to a paste. In a deep dish, add the ingredients for tempering and wait till the mustard finishes it dance and cools down. 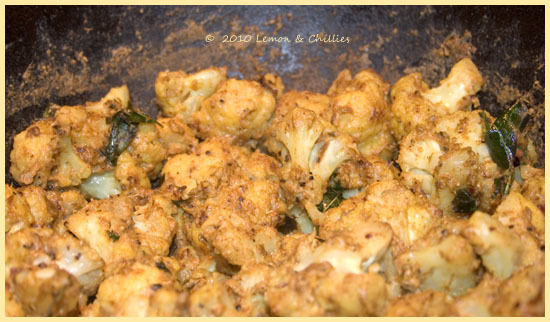 Now, add the chopped onions, wait till turns semi-translucent and then add the cauliflower, turmeric and salt. Close the dish and let it cook till the cauliflower is almost done. I like my cauliflower cooked but crunchy, so I just cooked for about 7-8 minutes, if you want it well done, cook for a little longer. Add the ground paste at this point along with the almond butter and cook it for a few more minutes. At this point, if you find it a little spicy, you can tone it down by adding another tsp of ghee or almond butter. Eat with rice & dhal / yoghurt or with rotis or just as is, as a little snack. It is perfect, any which way! If you do not have access to almond butter, just follow the original recipe and add a handful of cashews (or almonds) when you grind the ingredients.